If you’ve been watching Nadiya’s Family Favourites on BBC2, you’ll know what a fantastic baker she is. And this showstopper is no exception. It’s perfect for a special occasion. Or even just a lazy Sunday. Nadiya’s Family Favourites by Nadiya Hussain is out now (Michael Joseph, HBK £20). You need to make the honeycomb a few hours in advance. Lightly grease a large baking tray, preferably one with an edge. Line with baking paper. Put sugar and golden syrup into a medium pan on a medium heat and cook gently. Have a cup of water handy with a pastry brush. Occasionally brush down the inner edge of the pan just above the sugar. Once sugar has melted, turn the heat up just a little and leave the mixture to bubble away, until the whole thing turns a rich amber colour. As soon as it reaches this stage, add peanuts and stir through. Now add bicarbonate of soda and stir in really well. The mixture will bubble and rise up. Mix well and pour into the tray. It will spread of its own accord. Cool completely. This may take several hours. Preheat the oven to 180C/160C fan/gas 4. Grease the base and sides of a 20cm round, loose-bottomed cake tin, and line it with baking paper. Cream butter and sugar until light and fluffy. Beat eggs in a bowl and mix in banana. Add to butter and sugar and combine well. Add flour and baking powder and fold in until you have a smooth cake batter. Pour the mixture into the tin and level the surface. Bake for 45–50 mins. Remove from oven and leave to cool in tin for 15 mins, then remove from tin and leave to cool on a wire rack. For the icing, mix butter and peanut butter until combined into a smooth paste. Add icing sugar and milk and whisk until light and fluffy. 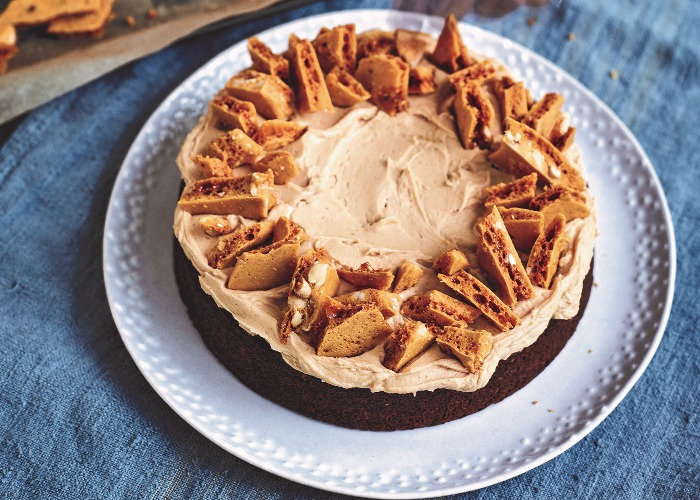 Once cake has completely cooled, smother with the peanut butter icing. Take 100g of the honeycomb, crush it up roughly, and use it to decorate the top.